If you stand on the bridge over the Brent, at Ruislip Road, you are able to glimpse Greenford’s past while experiencing its busy present. To the west are the shops and traffic of Greenford Broadway, to the east the trees and open ground of Perivale Park, a remnant of the farmland that surrounded an area once known as Stickleton. Strip away Lidl, the blocks of flats and parades of shops and see instead the buildings of Stanhope Park Farm, rows of cottages, a smithy at Greenford Road and the Red Lion pub in its original location close to the junction of Windmill Lane with the Broadway. This was a landscape familiar to James Hutt who spent his teenage years in the area but the place that he will always be associated with has one of the most emotive and evocative names in twentieth century history. That place is Passchendaele. One of almost half a million men who enlisted when war was declared in 1914, James passed physical examinations and took the oath in Hounslow. In August of that year he arrived at the Royal Garrison Artillery depot at Newhaven Fort in Sussex. James was about to become part of a massive expansion of the UK’s artillery. In 1914 there were three RGA siege batteries but by the time he was in Flanders in 1917 he was a member of 114th Siege Battery RGA, one of around four hundred that were created by the end of the war. He would have been part of a large team of over two hundred men, more than half of them gunners. 114th Siege Battery was equipped with six 6″ howitzers, drawn to their positions by horses that required drivers and support such as shoeing smiths, and the battery would have worked with artificers from the Royal Army Ordnance Corps. It must have been exhausting, physically demanding work loading shells, especially when they were firing at a rapid rate and it is hard to imagine what the noise levels must have been like. 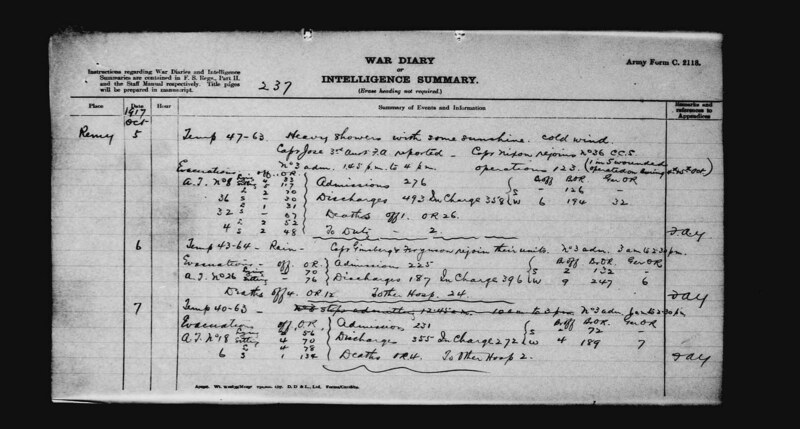 I got an insight into the degree of precision and speed required of them when I looked at Australian Imperial Force unit war diaries that mention this particular battery which in October 1917 was part of 68 Heavy Artillery Group, in 2 ANZAC Corps Southern Double bombardment group. I was struck by how detailed the orders were as to timings and rates of fire. Howitzers fired shells in high trajectories, relying on coordinates based on intelligence provided by the Royal Flying Corps and by observers in balloons. Photography was used to record enemy positions, the images processed out in the field and sent on as quickly as possible by couriers. These batteries bombarded roads and railway lines as well as destroying enemy stores and ammunition dumps where they were detected. All of this took place while they were themselves at risk of being discovered by enemy observers and fired on. In Belgium the other enemy was the rain, the heaviest in decades fell during the summer of 1917 in an area with a high water table. Field drainage systems had been destroyed by shelling with the consequence that batteries operated in a quagmire. Passchendaele, as the Third Battle of Ypres is often referred to, is synonymous with mud so deep and treacherous that men, horses and mules drowned in it. Guns had to be moved on plank roads, in some cases this meant lifting boards as they moved across them and repositioning them. It must have been a miserable and demoralising business. Some of the most powerful photographs of the First World War were taken at the time showing trees that had been reduced to blackened posts in a devastated landscape.. What a contrast with the green fields and woods of Middlesex where James had grown up. He was born in 1894, probably at 51 Disraeli Road, in an area of Willesden called Lower Place, and was baptised at Saint Michael and All Saints, Hillside where his parents had been married. His brother, Joseph, was born in 1902. Their father, John William Hutt, had been born in Wiltshire but grew up in the London suburb with its busy railway junction and new terraces of housing. A sign of just how fast the population of Willesden was increasing at the time is the fact that their local church had been extended only three years after it was built. John had been a twenty-three year old widower when he married Mary Ellen Beach, who came from Uxbridge. He was a labourer, probably getting work at two nearby farms and the competition for it may have encouraged their move to Southall. They were living at Waxlow Farm Lodge, which was situated close to what is now the junction of Cornwall Avenue and Lady Margaret Road, by the time their youngest child, John, was born in 1904. He was baptised, along with Joseph, at Holy Trinity in Uxbridge Road in 1905. In 1911 they were living at 7 Brent Cottages in Greenford and the census shows that two of their children, probably born in Willesden between 1894 and 1902, had died. At sixteen James and his father were working as carpenters. Acquiring a skill of that kind increased their chances of getting better paid work but the Hutt family probably weren’t that well off. Poverty existed in Greenford and malnutrition was common in the general population at the time so it may have been the prospect of regular pay as well as a sense of patriotism and a thirst for adventure that encouraged him to join up, his first steps on the road to Flanders. The Third Battle of Ypres began in July 1917 and in October the 114th Siege Battery RGA were tasked, along with 286 Siege Battery RGA, to fire on the village of Passchendaele. It was here that James, now an acting Bombardier, received the wounds that led to his death. After the war Lieutenant Charles Carrington of the Warwickshire Regiment described what it was like to be on the receiving end of a bombardment. It’s likely that shrapnel of this kind caused his injuries, which were severe and included a head wound. James was evacuated to 3 Canadian Casualty Clearing Station almost fifteen miles away at Remy Sidings near the border with France where he died at 2.30am on the 5th October 1917. He was twenty-two years old. A month later Canadian forces captured the village of Passchendaele. The Third Battle of Ypres was over at an enormous cost. His blood was shed but our hearts have bled. We are suffering. What a cry of pain and sadness. Mary Hutt lived to see her son’s name on Greenford’s war memorial when it was unveiled in 1921 but died only three years later. John Hutt senior and his surviving sons lived into their seventies. John junior remained in the area and lived in Stanhope Road at the time of his death in 1974. In Greenford there is only “J HUTT” carved into the base of the stone cross at the end of Oldfield Lane South to remind anyone that James ever existed, there’s nothing to tell them of what he experienced or the circumstances of his death. Greenford was a quiet place in 1914, a backwater that a bored young man might wish to escape from. Perhaps the normality of daily life in the place he once called home, the fact that our streets are busy and largely peaceful are the best memorial that he could have. I could not have written this without the help of Andy, Kevin, Paul and Charlie, members of the Great War Forum. Their assistance and knowledge was invaluable and I recommend it as a first stop in a search for information on the First World War. Please make a donation if you can to help this resource remain available. The Long Long Trail, a very useful site which also relies on donations. “Forgotten Voices of the Great War” by Max Arthur, Ebury Press, 2002. Stefan for telling me about the National Library of Scotland’s “side by side” maps. My partner, Martin, for finding trench maps, checking distances and displaying a remarkable degree of patience. The Imperial War Museum has an impressive photographic archive. Text © Albertina McNeill 2017 with the exception of quotation. Do not reproduce without written permission on each occasion. All rights reserved. Do not add text or images to Pinterest or similar sites as this will be regarded as a violation of copyright. At the author’s request this blog site has been excluded from Internet Archive.